Nova Anglia Novum Belgium et Virginia. 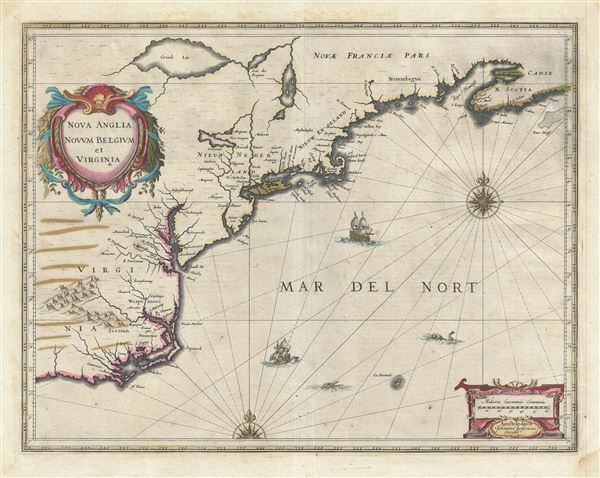 A fine first edition first state old color example of Jan Jansson's 1636 map of the northeast American coastline from Cape Lookout (here identified as C. of Feare) to Nova Scotia. The map includes parts of modern day North Carolina, Virginia, Maryland, Delaware, New York, New Jersey, Massachusetts, Connecticut, Rhode Island, Vermont, New Hampshire, Maine, and Nova Scotia. Most particularly, it offers some of the earliest depictions of the Chesapeake Bay, Delaware Bay, Manhattan Island, New Amsterdam, Long Island, and the Great Lakes. A large decorative title cartouche of a baroque ethic in the upper left quadrant present's the map's title Nova Anglia Novum Belgium et Virginia. The title sets the stage for the map as a whole, which can best be understood as a pageant of conflicting colonial and economic interests, in particular rivalries between English, Dutch, and French colonies. The very title, in which Nova Anglia supersedes Novum Belgium (named after the Belgian based Walloon Protestants who were the primary backers of the Dutch West India Company), exemplifies many of these issues. In subsequent editions of this map Jansson reversed the title order giving Novum Belgium precedence. Jansson centers the map on New Nederland and more specifically on the Hudson Valley, sandwiched between English colonies in Nieuw Engeland (New England) and Virginia (Jamestown). Along the Hudson, identified using the Dutch term Noorde Rivier, Fort Orange (near modern day Albany) and New Amsterdam (New York) are identified. As this map was being drawn English and Dutch trappers would have been in fierce competition over the peltries along the Hudson, Connecticut (here Versche Rivier), and Delaware (here Zuydt Rivier) Rivers. These rivalries would eventually escalate into the English takeover of New Amsterdam in 1664 and its subsequent reassignation as New York. Several ships ply the seas and compete with two decorative compass roses, a recognizable Bermuda, and a secondary cartouche in the lower right quadrant featuring Jansson's imprint as well as a distance scale. This map was issued for the 1636 Appendix Atlantis Oder dess Welt Buchs but examples can also be identified in various editions of Mercator's Atlas Novus which was published in the same year. The present example, being a first state, features French text on the verso indicating that was extracted from the 1639 issue of the Nouvel Atlas. Very good. Original centerfold. Full margins. Old Color. French text on verso.